AP Police Constable Admit cards/ Call lettes for PMT, PET, Certificates Verification 2019: Andhra Pradesh State Level Police Recruitment Board (APSLPRB) has released the admit card for Physical Measurement (PMT) and Physical Endurance Test (PET) and verification of certificates for the post of SCTs PCS civil and AR (Men and Women) and APSP (Men), Warder (Men and Women) and firemen 2018. Candidates who have cleared the written exam can download their admit cards from the official website slprb.ap.gov.in. 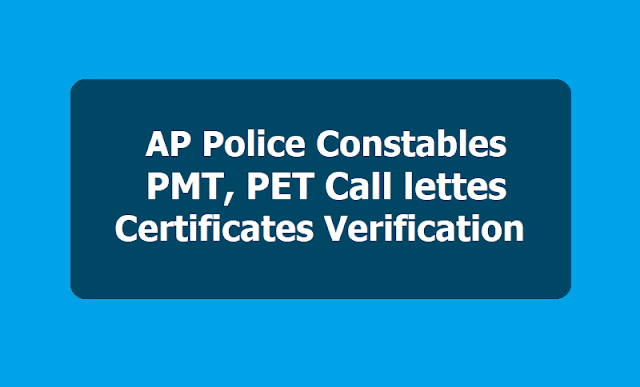 Andhra Pradesh State Level Police Recruitment Board, APSLPRB has rescheduled PET/PMT exam for Constable posts. The dates are rescheduled for the qualified candidates for SCT PCs in Krishna and Nellore Districts. Candidates who will appear for the exam in these two districts can check the official site of APSLPRB at slprb.ap.gov.in for the exam details. A total of 9575 candidates will have to appear for PET/PMT exam in Krishna District and 6181 candidates will have to appear for PET/PMT exam in SPS Nellore district. Earlier, the PET/PMT exam was to be conducted on February 07, 2019 for Krishna district which will be now conducted on February 18, 2019, and on February 19, 2019, for Nellore district which will be conducted on February 20, 2019. Click on the link for download of call letter for PMT, PET and verification of certificate. Candidates can login using details of their hall ticket, registration number and date of birth. The written exam was held for SCT Police Constables (Civil) (Men/Women), SCT Police Constables (AR) (Men/Women), SCT Police Constables (APSP) (Men) in Police Department and Warders (Men), Warders (Women) in Prisons and Correctional Services Department and Firemen in A.P. Fire & Emergency Services Department. The written exam was held at 28 locations at 704 centres. A total of 3,46,284 candidates took the exam out of 3,92,785 candidates who had registered for the exam. The written test comprised questions from English, Arithmetic, General Science, History of India, Indian culture, Indian National Movement, Indian Geography, Polity and Economy, Current events of national and international importance Test of Reasoning / Mental Ability.